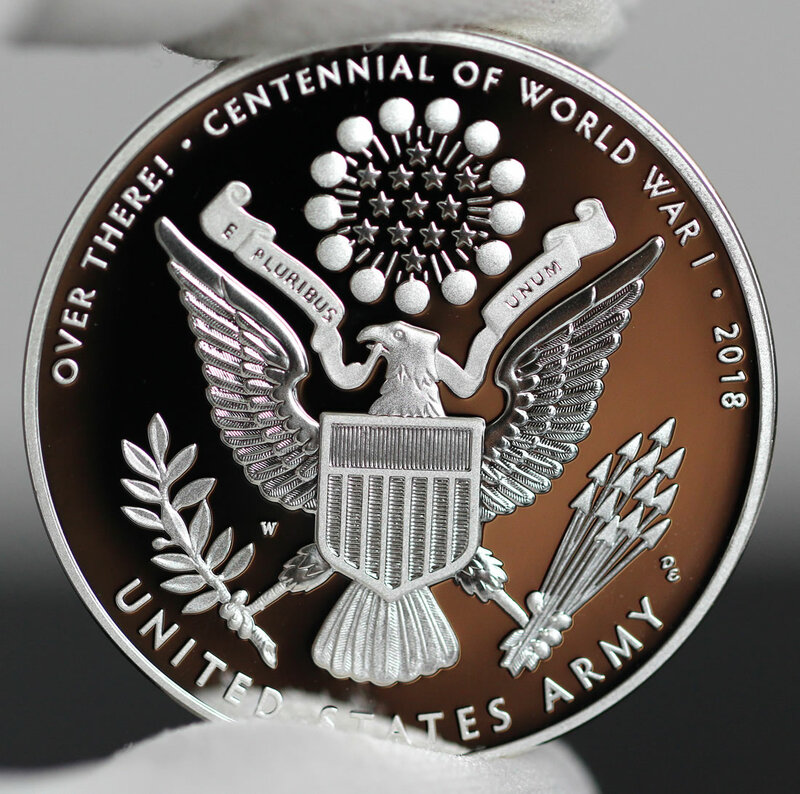 This article presents photos of a World War I Centennial 2018 Army Silver Medal, one of five United States Mint medals commemorating the branches of the U.S. Armed Forces that were active during the First World War. 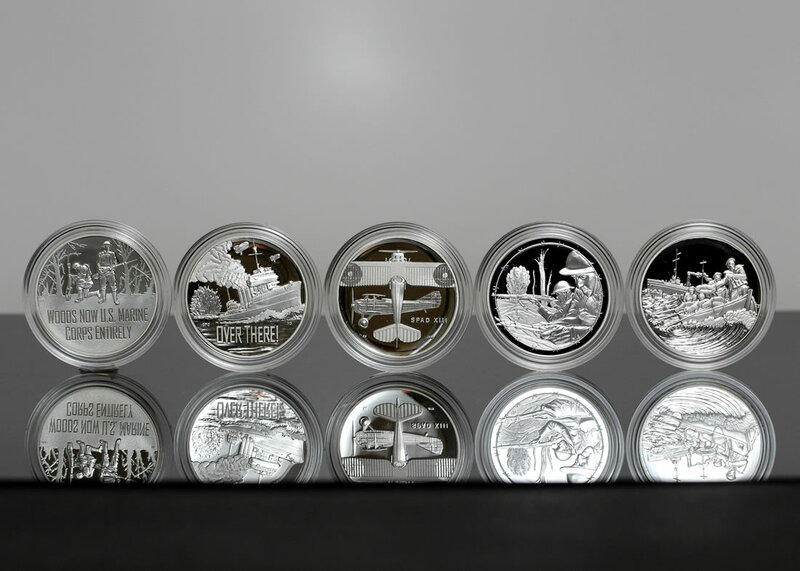 On Jan. 17, the United States Mint released silver medals with designs honoring the Army, the Navy, the Air Service, the U.S. Marines and the U.S. Coast Guard. 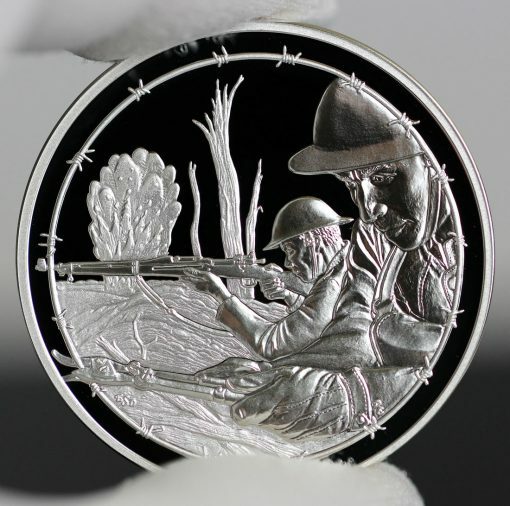 Conceived, developed and struck by the U.S. Mint to boost support for the congressionally directed World War I Centennial Silver Dollar Commemorative Coin Program (Public Law 113-212), each medal was paired with a proof WWI dollar and sold as a unique set. While the WWI Centennial Silver Dollars will be available until the end of this year — with the proof edition $56.95 and the uncirculated version $53.95, the dollar and medal sets at $99.95 each had a sales deadline of Feb. 20. 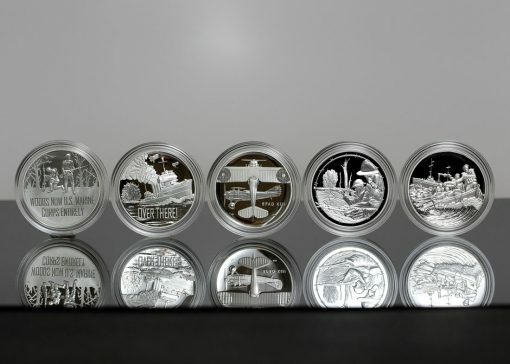 The set with the Army silver medal turned out to be the most popular with last reported sales at 14,577; followed by sets with the Marines medal at 11,580; the Air Service medal at 11,428; the Navy medal at 11,302; and the Coast Guard medal at 8,668. CoinNews photo of World War I Centennial 2018 Silver Medals. Weighing 26.730 grams, each is struck in 90% silver and 10% copper. Army silver medal obverses (heads side) depict a soldier cutting through German barbed wire while a second soldier aims a rifle amid an exploding shell and a shattered landscape of broken trees and cratered earth. Emily Damstra designed the image and Don Everhart sculpted it. Also sculpted by Everhart, reverses feature the United States Army emblem, which was also in use during World War I, with added inscriptions of OVER THERE!, CENTENNIAL OF WORLD WAR I, 2018, and UNITED STATES ARMY. 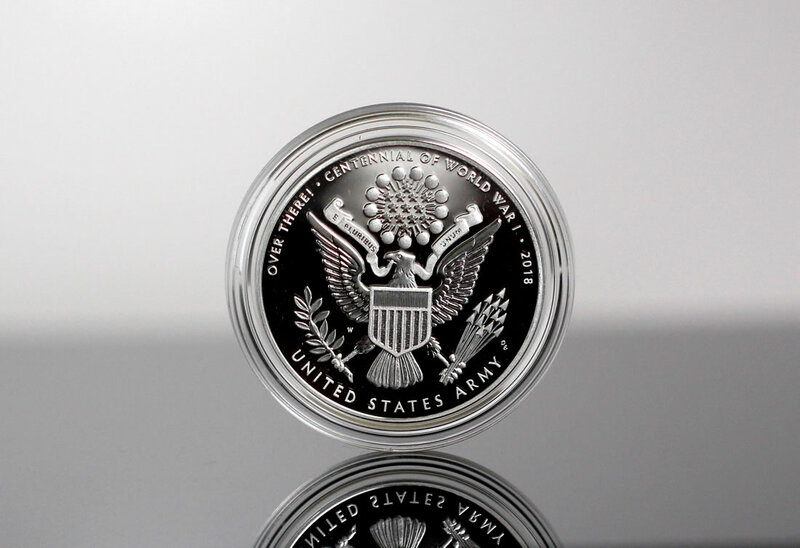 Produced at the West Point Mint, the reverse also has a "W" mint mark. 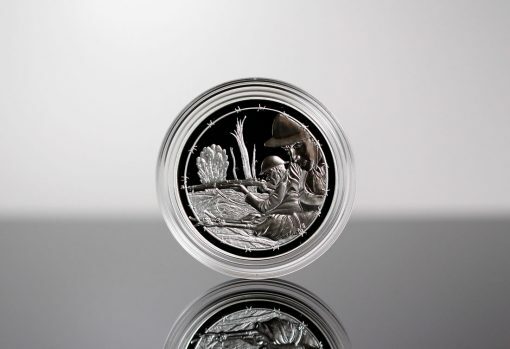 Specifications of the silver dollars and silver medals include a composition of 90% silver and 10% copper, a weight of 26.730 grams, and a diameter of 1.500 inches. 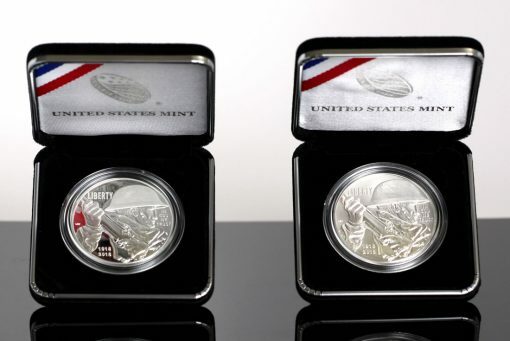 The dollars have a reeded edge while edges of the medals are plain. 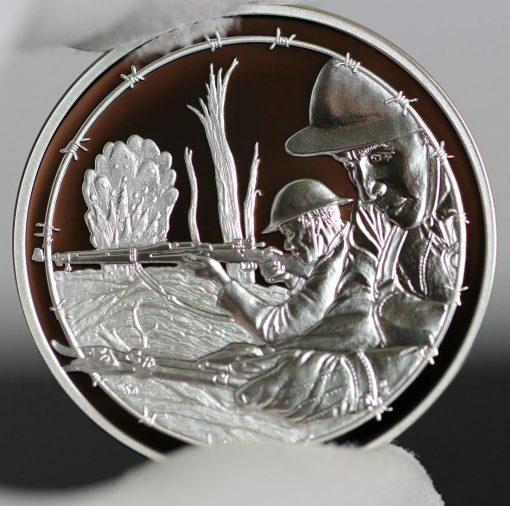 Buy World War I Centennial Silver Dollars from the U.S. Mint’s commemorate online store right here. 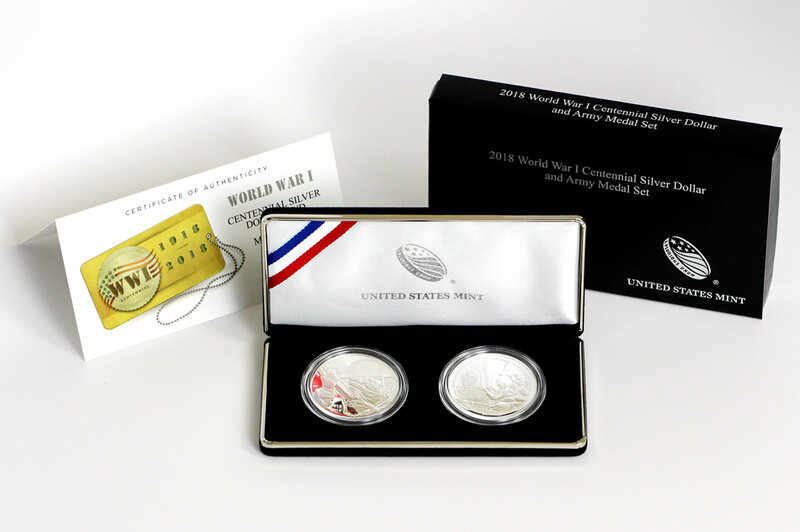 Surcharges of $10 are collected on the sale of each dollar with proceeds, after associated costs, paid to the United States Foundation for the Commemoration of the World Wars to assist the World War I Centennial Commission in memorializing the centenary of the war. 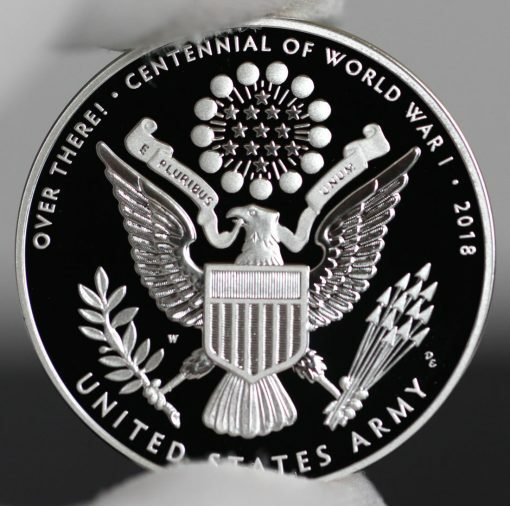 Below are a few more photos of World War I Centennial 2018 Army Silver Medals. Thanks as always for sharing your great his res photos of these coins & medals. 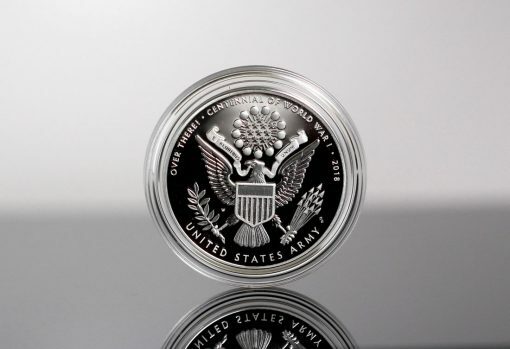 As a former Air Force/NSA brat, I only bought the Proof silver $1 coin & medal set. Very nice set & presentation! The complete set of all 6 items (1 coin & 5 medals) graded PCGS Proof-70 Deep Cameo is going for $1795 from a very reputable PCGS-authorized dealer in California that I have dealt with for the past 5 years. The same 6-item set graded PCGS Proof-69 Deep Cameo is going for $595. That is an amazing $1200 difference between the 69 & 70 graded sets!! Amazing! i can’t afford all 6 either ,so i bought a certified 70 ngc unc. dollar plus the regular dollar & medal set coast gaurd,figuring that set would be the lowest mintage.now i keep my fingers crossed for the future.